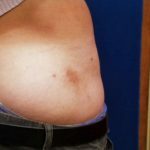 Abdominal liposuction performed by a general doctor with over resection and severe contour abnormalities. This was revised by using fat grafting and an abdominoplasty. Fat grafting of depression in buttocks from a steroid shot. 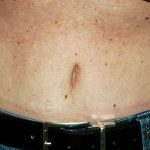 Revision of belly button following abdominoplasty. 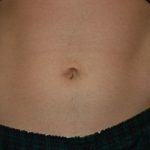 The original surgeon placed the belly button too high and created a slit like appearance. 18-year-old patient with umbilical deformity. 4 weeks following umbilical revision surgery.